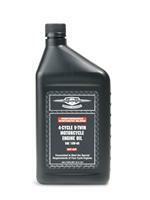 Synthetic blend exclusively developed for 4-cycle motorcycles, providing excellent engine protection, cleanliness and exceptional clutch and gearbox operation. Helps protect internal parts from rust and corrosion. Meets or exceeds: API SF/SG; SH/SJ with JASO MA.